NEW class coming for 2019 register your interest and let me know when & where you’d like to ‘tap to your own beat’! The world’s first Tap dancing fitness workout, created by world recognised tap dancers and fitness professionals out in Australia. A fantastic fun class combining tap dancing, cardio, resistance training and body sculpting moves to get you maximum results for your body and brain. Aby has tap danced for over 25 years professionally and is a qualified ISTD Tap teacher, teaching Tap to all ages (3 – over 70yrs old) and all levels from beginners to advanced. When TAPfit was introduced last year to the UK, Aby had great fun working with the Australian creators and becoming a qualified TAPfit instructor. With the TAPfit formula and Aby’s experienced tap background, Aby can fuse tap with fitness, using genuine tap steps, varying music and tap styles from Broadway to Urban, Latin to Commercial. Who are Aby’s TapFit classes suitable for? Can I wear Tap shoes? 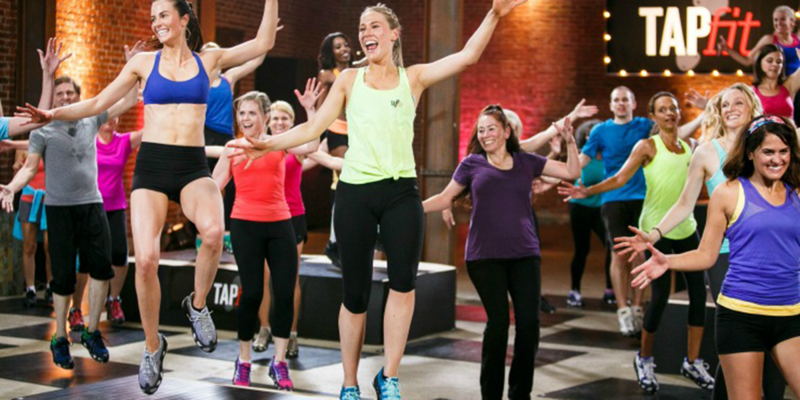 When are Aby Kate's TAPfit classes? Whether a complete tap beginner or if you have tapped in the past and just love tap dancing … this class is for you! This class is suitable for all fitness levels low-impact options available. If you have your own tap shoes you can wear these but please be aware that they will not support as well as trainers for high impact work. NEW TAPfit classes coming in 2018 please contact me to register your interest.